I have always loved architecture. When I was 10 or 11, I started painting with oil paint. I would copy Vincent Van Gogh’s work, and, I would build models of futuristic cities out of chip-board or whatever other materials I could scavenge from our household. One of my cities grew around a working scale model of the Monorail at Disneyland, which I coveted. My parents always indulged my creative impulses, so they allowed me to paint anywhere and to construct my own private future world on their dining room table. The monorail ran in a loop around and through the city, transporting the tiny invisible commuters who lived and worked in my utopian chip-board world. When I think about that now - how lucky was I that my parents were supportive enough to allow me to basically take over our dining room? I would carefully add the leaves of the table as my city grew and there was a card table for the raw materials, scraps, glue, knives and sketches that were strewn everywhere. I can’t recall the fate of my futuristic city. Did it have a name? I’m not certain there were any photos taken of it - even with my Brownie Starmite. At some point my parents must have had a large family gathering and the city was dismantled. Deconstructed, like the Sixth Street Viaduct - a tragedy in my 11-year-old brain. My model building eventually shifted from cities to cars, but I did continue to paint. I studied architecture in college, mainly drafting and urban planning courses, but it didn’t stick. I was preoccupied with my first love - painting. I did architectural drafting and built models for an architect friend when I moved to Santa Fe, back when draughtsmen still used pencils, drafting arms, protractors, erasers, cardboard and chip-board. I loved the process, calculating and problem solving. I loved the challenge of precise line weights and the lettering - at which I never really excelled. I worked for years on designs and considerations for the remodel and expansion of our house and studio in Santa Fe, including sketches, drawings and models. And, yes - on the dining room table. Another bottom line - if I weren’t a painter, I’d be an architect. Enter the Sixth Street Viaduct. My obsession with the Sixth Street Viaduct and its deconstruction apparently originates from many sources, impulses and desires. Unfulfilled dreams perhaps? It began soon after settling into the DTLA loft in September 2015. Every photographer, and every painter for that matter, needs a subject, a starting point, a conceptual premise in which they can immerse themselves. I found mine as the days of exploring and shooting the bridge turned into weeks, then months, then a year. My initial infatuation with the viaduct expanded exponentially as I spent more and more time looking at it and shooting it. The more time I spent in Los Angeles the more I realized the considerable impact of the bridge, its demolition and its future. I’d been aware of the iconic nature of the Sixth Street Viaduct since studying at Otis Art Institute years ago. Who in LA wasn’t aware of it? Moving into an area so close to the bridge and learning of its imminent demise somehow heightened its presence. Even though I couldn’t see it from the loft, it loomed weighty and melancholic. I knew its days were numbered. I sensed it did too. The realization that this monumental architectural “celebrity” would be demolished was staggering to me. I imagined the ambitious complications and engineering wizardry in its tearing down would equal its construction. It fascinated me. How would it be accomplished? And, in only a year? Artists can start a project with one thing in mind. Perhaps on a whim or instinct, which sows the seed of a concept. 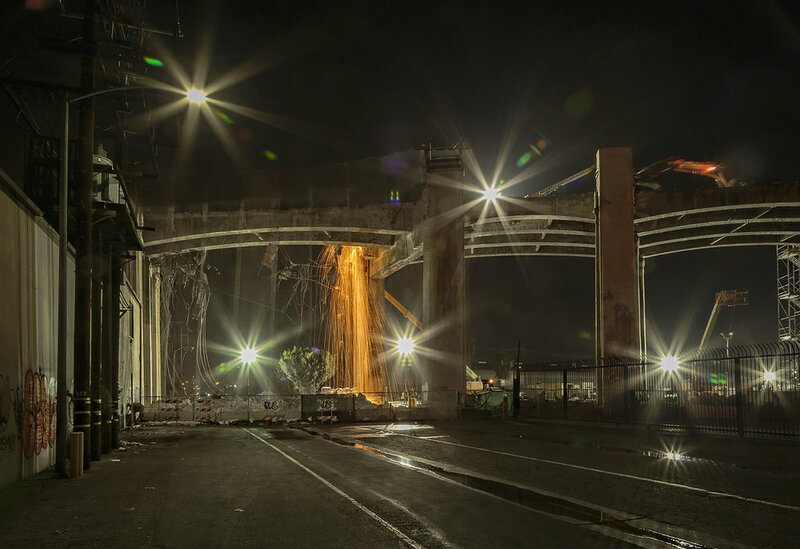 As I delved deeper into the Sixth Street Viaduct and its history, its current state, anticipated demolition and rebirth my intentions evolved and grew more complex. As I persevered, the project shifted, altered and became clearer. I was swept into its labyrinth. ‘Be here now and go outside your comfort zone,’ I kept telling myself. With a heavy backpack, full of camera gear and a tripod, I started riding my bike to the bridge and its tunnel to access the LA River channel whenever I was in LA. The first expeditions were prior to the bridge’s roadway closing. There was a large community celebration for the Sixth Street Viaduct in October 2015, which took place on the viaduct itself. It included an unveiling of the new design - complete with family activities, food trucks, a concert, mural painting, art exhibits and fireworks. I missed the celebration, as I was in New Mexico that month, but I preferred to spend my time at the bridge alone anyway - wandering, looking, exploring and discovering. I’m forever the mercurial artist. It was easy to access the LA River via the concrete tunnel under the Sixth Street Viaduct at Santa Fe Avenue. From the river channel itself the bridge seemed more massive and mysterious in the afternoons and early evenings. Waning sunlight sometimes casts a surreal yellow-orange glow on the gargantuan central pier and the end columns supporting the steel arches over the river. I’d set my tripod low to the ground on the concrete riverbed to exaggerate the grand monumentality of the bridge. Often I would venture into the river itself - but I’d steer clear of the deeper five-foot-wide central channel. The concrete channel under the few inches of slowly flowing water was slick with moss and algae and fairly disgusting. All kinds of garbage and other unidentifiable refuse floated by constantly. Definitely not something you’d want to slip and fall in – although that did happen. On my way home one evening, coming south from the Fourth Street Bridge, I elected to bike the channel, even though I knew I was in a slimy section running with three or four inches of water. I looked up at the Sixth Street Bridge as I headed towards it and the next thing I knew, my bike slipped out from under me. I went down, hard. Thank Zeus my camera and tripod were secure in my backpack instead of on my handlebars where I would often anchor them for quick access. I thought of that first, with relief, as I was flattened in the cold wet slime - with the steel edge of my bike peddle embedded into my right shin. Ugh! In the twilight, I watched what I realized was a dead cat rolling downstream, ever so slowly, about 10 feet away from me as its legs, stiff with rigor mortis, surfaced now and again. Scrambling to get up, I slipped down again. The water was foul and repulsive. Trembling, my leg bleeding from the puncture wound, I finally managed to right myself and the bike on the third try. I knew I was completely addicted when I took the time to get my camera and tripod out of the backpack and shoot the dead cat in the river. Who would believe me? I packed up, again, and quickly, albeit cautiously made my way out of the river channel, through the tunnel and up to the street lights on Santa Fe Avenue. I parked myself and tried to scrub the wound and scratches clean with some antibacterial wipes stashed in my backpack. When I got back to the loft I stripped, immediately tossed all of my clothes in the washer, doused my shoes in alcohol, got in a steaming hot shower and scrubbed myself raw. In the moment I was aware of my situation, but getting the shot was my only concern - not unlike the deep meditative zones we enter when cognition of our surroundings is ever-present, albeit sitting in the back seat - while focused intent, no matter the circumstance, is unquestionably driving.. In reality the LA River doesn’t smell as repugnant as it looks, although I sure as hell wouldn’t drink from it. Actually, there was and is plenty of wildlife in the Los Angeles River especially migratory birds. In addition to the detritus and dead felines, there are ducks, egrets, terns, stilts, avocets, sandpipers - and male underwear models and their photographers on shoots. LA Wildlife. There was always something intriguing and fun to see as long as I wasn’t lying in the water and there was no sign of rain upriver, but precipitation was rarely an issue in LA. Weekdays I would go to the bridge in the late afternoon to access the river via the tunnel. I was mostly alone on my expeditions and would stay late into the night shooting, which meant I would feel a bit uncertain riding my bike back up the graffiti lined pitch black tunnel to Santa Fe Avenue. But I continued to do it as long as the tunnel stayed open. Occasionally there would be a person leaning against the wall or crouching near the tunnel’s river-side entrance; the floor was almost always wet, potholed and I needed a flashlight so I could spot the small craters and rifts. I held my breath as I rode, the stench unbearable - sweetened and reeking of fresh enamel. It was creepy but alluring. The last 50 yards of the tunnel’s ceiling, on its west end, was open to the concrete underbelly of the viaduct’s sloping roadway 30 feet above, allowing the corridor walls to be illuminated by the sodium-orange street lights of Santa Fe Avenue and revealing the spray-painted layers of the continually evolving “pentimentoed” tags. It was always a relief to see that glow become more distinct and brighter as I made my way up and out of the tunnel at night. Riding out of the river one night, I saw what appeared to be an intermittent large flame suspended mid-air at the far end of the tunnel. It turned out to be a guy practicing fire-breathing on top of a black Ferrari in the “open-air” section of the tunnel. More photo shoots. More “LA Wildlife.” Once out of the tunnel, there would be some other homeless guy or a policeman on a bike with whom to chat or question a bit. The most frequent question I asked and that which was posed to me, “Do you have any idea when they’re going to close the tunnel?” I never got a definitive answer from anyone, nor could I provide an answer. Despite the sketchiness, I always felt safe and unthreatened, even though I’d be making my way back around midnight or even later. On weekends, I would see car clubs gather at the bridge with their beautifully restored and modified vintage Chevys, Cadillacs, Pontiacs or Fords reflecting the sun or street lights in their luster paint jobs. The club members would meet and park their gleaming pristine vehicles off of Santa Fe Avenue under the bridge where there was plenty of space to park. They would all just hang out, showing off their own and admiring each other’s rides. Or, they’d engage the hydraulics, drive carefully down the tunnel into the river channel, then lower and situate the cars precisely to have their photos taken with the Sixth Street Viaduct as a backdrop. There were a lot of homeless guys in the river channel camping at various points under the bridge, in the large drainage channels that entered the LA River on the steep concrete banks or merely occupying the concrete floor of the channel where the water wasn’t running. The California drought definitely had some benefits for the homeless. One guy possessed a heavy baroque chair - ornately gold painted with a black velvet cushion and seat back - an unexpected furnishing for his bivouac in the channel. Odd and utterly out of context, he allowed me to reposition it slightly, shooting the chair a couple of times with the sunset drenched concrete piers of the bridge radiating in the background. No one would dare sit in the chair except him and he didn’t want his photo taken, so the images feel empty and alone. An embellished outcast with a grand era backdrop - all three soon to vanish. On a solo excursion to the river channel in late 2015 I watched a musician with his guitar taking multiple selfies - he would prop his iPhone against his guitar case using a timer and strike a pose with the colossal central pier of the bridge as his looming sole gargantuan audience. Another evening someone dropped a rope swing from the roadway down to the concrete channel. The swing-seat itself at the end of two 50-foot long ropes swayed slowly and gently about 10 feet above the channel floor. A ladder was needed to reach the seat and when someone would climb the ladder and start swinging, it was as if they were moving in ultra-slow motion. Magical urbanized dreams. People of all ages continued to traverse the tunnel to access the river channel throughout the early months of 2016 - but not the masses that I expected. Mostly photographers. Some with models in tow and many younger adults, hip cool urban dwellers up for an escapade or perhaps a school project, and usually in groups of two or three. I suppose most people thought that since the roadway above was closed, access to the river channel must be closed too, hence so few people. There wasn’t really another viable way to access the LA River channel for miles in either direction. One could traverse railroad tracks and hop fences, but the closest “legal” access I discovered via an artist friend was a few miles north in Lincoln Heights. Along with shooting down in the LA River channel, most every day I was in Los Angeles I would venture east across the Seventh or Fourth Street Bridges to document the progress of the demolition from that perspective and location. The viaduct structure was equally as monumental on the western periphery of Boyle Heights in the industrial/warehouse zone, where the demolition began. After a miraculously quick 40-hour demo of the 250-foot concrete span over the 101 Freeway, the spans running west towards downtown were pummeled by a fleet of enormous excavators with hydraulic jack hammers up on the roadway itself, leaving behind stands of colossal columns three abreast. Appearing like Roman ruins with the gleaming electric skyline of downtown Los Angeles in the distance, they felt and looked apocalyptic. Remnants of 1930’s grandeur – bombed out and destroyed with intention and a greater purpose. The groups of columns that were adjacent to existing buildings and warehouses, many of them art galleries, were draped with wire mesh on the building side - vast hanging sheets of sheer chain mail. These metal draperies protected the existing buildings from the crumbling falling debris as the excavators chipped away at the structure. The crews managed to insulate the existing businesses from damage simply but effectively. And the draperies were beautiful, almost translucent, like looking through lace as they heightened the elegant scale of the columns. Once the spans were demolished by the hammering excavators the crews would move on to dismantling the columns. The initial columns would be cut into 20 foot sections while gigantic cranes would be parked nearby on platforms constructed of huge timbers and plate steel. The cranes would lift these sections from their bases, after they were prepared and cut loose, and then lower them into massive pits to be broken apart. I spoke with one of the supervisors of the de-construction crew, after I noticed they were taking a different approach to bringing down the columns. He explained to me (although I was never clear if this was his idea or not) that they discovered it would be more efficient and cost-effective to dismantle some of the columns by felling them, as if they were trees. The process involved fixing steel plates to the upper reaches of the columns, which would support draping a long steel cable down either side. The excavators would then chip away at a small section around the base of the column and welders would cut away the exposed rebar embedded in the concrete with oxy-acetylene torches. The cable was held taut by an excavator with a closable bucket on its end and it would basically pull the 40-plus ton column down with the cable. Über timber - on steroids. Roosting pigeons on the very tops of the columns would ride the falling pillars as they slowly toppled, waiting until the last minute to fly off. These minuscule feathered custodians of their behemoth accommodations, were reluctant to leave, until they had no other choice. The ground would briefly rattle like there was a minor seismic tremor when the columns would hit the prepared mounds of dirt and rubble. While not strong enough to take down the other columns standing next to the one felled, you would not want to be standing directly next to any of them. Once a pillar was down on the ground the jack hammered excavators would go to work breaking apart the already crumbling diseased concrete. It was a brilliant idea. I never really found out who came up with the plan or the engineering, but the supervisor I talked to complained about the process being held up by city inspectors, even though no one had any experience engineering felling concrete columns - except him. After posting a few of my photographs of the “column felling” on Instagram a crew member, who happened to be in the photos, saw them and recognized himself. He contacted me and we started communicating fairly regularly. He would tell me when the crews were working at night – which became my favorite time to shoot - especially when the torch crews would cut exposed rebar from the tops of the pillars. Showers of red-orange-yellow burning waterfalls would spray out in an arc to the ground and bathe the columns with a warm orange glow, accompanied by the hiss of the oxy-acetylene torches. Laden with chunks of concrete, the torches would keep cutting the rebar and the sparks would fly until the weight of the concrete and its captive steel strands would break free and plummet to the earth. Prior to being cut or broken apart, sprays of rebar emanated from the colossal piers and columns before and after they were felled. Mass tangles of various sized rebar, formerly holding the concrete together internally, were now freed. The various lengths of straggling lines of steel, the systematically ordered skeletal framework of the bridge, was now bent and exposed haphazardly from the excavators pulling and hammering on the attached concrete spans. The still standing giants looked as if they had woken up on a bad hair day - or a good hair day, depending on one’s point of view. The felled columns were leviathans with radically extreme bed heads. What remained of the columns once they were broken apart was the structural rebar. Square rebar. Aggregated quantities of beautifully tangled square steel rebar. Rebar today is round, so it can be bent in any direction. In 1932 rebar was square, thus it could only effectively be bent in four directions. Sometime in the 1940’s rebar manufacturing switched to being round. I met a crane operator and he explained all this to me, and gave me a small piece of the two-inch square rebar. It has a curve at one end and it obviously snapped at both ends. A remnant. But I see it as a small sculpture. I keep it on the mantle over the fireplace at the loft - along with another piece nearly identical in size that I found a few months later on the west side of the river. They remind me of history, and change. The large excavators would bunch up the rebar into knotted snarls - elegantly complicated steel drawings that gave the impression of contemporary sculpture, especially when lit by the street lights at night. I liked to imagine an excavator operator pushing, shoving and intentionally manipulating those steel jumbles until they were perfectly randomly wrought. An exquisite array of three-dimensional lines dynamically moving in and out of its own mass with some ends breaking free and chaotically pointing out of the nest. A fully conscious but random aesthetic process? Maybe. Or more likely, it was a backhoe operator, competently bundling de-construction debris for salvage and recycle. The repetitive progress of breaking down the spans, felling the columns and removing the resulting rubble moved west from the 101 Freeway to the Los Angeles River slowly - although more rapidly than I expected. When I was in New Mexico for three or four weeks at a time I would come back and could visibly see the progress, although when I was in LA and shooting nearly every day, the progress was much less apparent. Still the process was astonishingly quick. My schedule caused gaps in the documentation process - but the thousands of photos I was able to shoot when I was in Los Angeles managed to capture a fairly thorough visual narrative. One evening I parked my truck on Clarence Street, along the curb, next to the sidewalk and a chain link fence that was keeping me out of the de-construction zone. The site line from that spot looking west aligned directly down the north side of the longest stretch of the bridge - or what was left of it - and the skyscrapers of DTLA in the distance. I hopped up on top of my Silverado truck cab, not the bed, with my camera and tripod, in order to shoot the Roman-looking viaduct ruins over the chain link fence. My camera on its tripod and I were precariously situated on the slick surface of the thin roof. When I’m up there I move carefully so as not to dent the metal, fall off or blur the long exposures. I heard a bottle breaking in the street and looked north up Clarence. There was a homeless guy meandering towards me in the middle of the road about 50 yards out and he had just thrown the bottle. He was moving towards me but I didn’t move, hoping he wouldn’t notice me. No such luck. I imagined he was going to rush the truck and start shaking it in order to make me and the camera tumble off. Instead, he shuffled his way directly towards my vehicle, stopped, leaned gently against the side of the truck bed, looked up at me for a few seconds, which seemed like minutes, and said, “nice camera.” Equally considerate, he pushed off the side of truck towards the chain link fence a few feet away and wistfully starred at the remnants of the bridge. He began commenting on Los Angeles, the old viaduct, the new viaduct and how this renewal project will change everything. He wasn’t really talking to me, nor was he even talking at me; he was reminiscing and conjecturing, mostly incoherently, about the glory days of Los Angeles, the Sixth Street Bridge, the glittering skyline, the transformation of the area once the new bridge was finished and on and on. I managed to shift my camera down and change its orientation to include him in the frame. He didn’t know that I was including him in the shot and I felt guilty for not asking him. It was a moment. His back was turned towards me and he was moving ever so slowly, swaying. Clearly he’d consumed whatever had been in the bottle he threw. I did manage to include him in a few shots, an ephemeral, ghost-like presence, as he continued to ramble on about the towering ruins of viaduct pillars - with an overtone of doom, reluctance and foreboding. Two cats screeched across the street. The man’s head jerked towards the sparring cats and he sped off towards them, faster than I thought humanly possible, as if he was going to break up the fight or, catch his next meal. Just like that - he was gone - and I was still on my truck roof shooting. The moment was poignant, eerie and ironic. The specter of a man, framed by a sunset sky as impressive as in New Mexico, longingly looking at the bridge ruins with DTLA’s rapidly developing skyline as the backdrop, ablaze and sparkling like the “Emerald City” - no longer directly accessible from the broken bridge where we stood. There was no clear connection between foreground, middle-ground and background. Was this man blaming his city for the destruction of the bridge and his plight? The phoenix-like resurrection of the Sixth Street Viaduct will be architecturally consistent with that brilliant DTLA skyline - the shortest link between Boyle Heights and the burgeoning Arts District and the flourishing urbanized Bunker Hill a few more blocks west. Will he be able to cross it? One day in June I rode to the tunnel access. It was closed. Locked chain link gates blocked access to the river permanently to the public. Permit or not - the location was over. That was the end of the easy and legal access to the river channel in close proximity to the loft. I focused on the remaining portion of the viaduct on the east side of the river, shooting at night almost exclusively and primarily when my Instagram de-construction crew member buddy would alert me to night-shift schedules. I found access to the east side railroad tracks off Mission Street and began crossing the eight sets of track to shoot the bridge. In July of 2016 there were multiple fires in the San Gabriel Mountains and the Angeles National Forest. Smoke from the Sand Fire moved over Los Angeles clogging the continually compromised atmosphere. A veil of rusty-orange and burnt grey obliterated the pale blue sky and turned the sun blood red. I was out shooting the bridge from the tracks on the river’s east side; it was late afternoon but the darkened sky from the smoke made it seem later than it was. While I was shooting the still intact center section of the bridge spanning the LA River with that threatening sky throwing a rusty orange cast over everything, I noticed darker smoke rising from a closer spot, west of the end of the bridge and in the general vicinity of our loft. The plume of black smoke rose into the muddied sky and steadily grew larger and blacker as news and police helicopters buzzed overhead. I kept shooting, worrying a bit that the second fire was closer to the loft than I estimated or even dared to consider. The evening felt ominous, post-apocalyptic and looked catastrophic. An omen? Was all of Los Angeles going to burn? No, but it sure as hell appeared like it at the moment. Timing. The smaller fire, I found out that evening, was a pallet yard going up in flames that took with it a warehouse with an artist’s studio – three blocks from our loft. Disastrous. I continued to shoot the demolition work on the east side of the LA River and on the section of the viaduct directly over the LA River. Crossing the multiple railroad tracks was tricky and dangerous, but I was always careful not to cross when there was an outgoing or incoming train. Most of the tracks had stationary lines of boxcars or tank cars. I would slip under them to position myself for the best view of the continuing work on the bridge. Usually there was a stationary train adjacent to the river, or a few tracks away where I could set my tripod between two train cars and shoot with an unobstructed view of the viaduct. I was hidden from the occasional guard patrolling the area and I would photograph for hours, late into the night. The dismantling process was now to the point of cutting the steel cross ties connected to the iconic steel arches over the river, then lowering them down to the channel with one of the mammoth cranes. It was slow work, providing time for the long exposures I was taking that would record more of the showers of sparks as they gracefully cascaded into the riverbed below and the blurred descent of the cross beams. From some vantage points I could catch the fiery showers reflected in the water of the Los Angeles River. Late one night, after shooting for hours, the crews stopped working and I decided to leave. It was around 11:00 pm - my partner asleep at the loft and ever tolerant of my fixations. I just wanted to get back home and crawl into bed. As I was packing up my gear a train pulled into the area on one of the sets of tracks blocking my only exit path. It slowed to a crawl with an occasional momentary stop. Mostly it kept moving, not slow enough for me to cross but painfully slow enough for me to stress about how long it would take to pass through the area. Apparently, forever. It was a long train and seemed to be purposely preventing me from leaving. Then a second train pulled into the area on another set of tracks. I was trapped. It stopped, moved a bit, stopped again. After an hour of waiting, watching and timing the trains as they moved slightly and then stopped, I made my move. The minute both the trains stopped I quickly and stealthily snuck under one, then decided to pass under the other. Freedom! Finally, the trains had come to a standstill. Exhausted and nervous from having been trapped, I was walking towards the access path to Mission Street along a fence that bordered a dimly lit viaduct rubble zone. There, just a foot away from the chain link fence, was a long section of the square rebar. As tired as I was, I dug out some dirt and rocks from under the fence, reached through and with some difficulty, pulled the long piece of rebar out from under the rubble to my side of the fence. Freedom again! The piece was heavier than I imagined and I was beat, but I was determined to drag myself and the rebar to my truck parked right next to the access path on Mission. I threw the rebar in the truck bed, jumped in the cab with my backpack and hastily made my way back to the loft with my treasures - in the camera and the bed of the truck. In mid-September, I rode my bike to the Los Angeles River’s Lincoln Heights access to meet an aerialist/artist friend, who told me about that access. He had accompanied me on a few of the Sixth Street Bridge excursions in the summer and is another Santa Fe expat. The distance from the loft to the access point is about five miles via surface streets; the trip back along the LA River channel to the Sixth Street Viaduct is maybe three and a half miles because it is primarily an as-the-crow-flies route. We rode carefully along the concrete channel in the first half-mile due to the low water slime factor, maintaining a straight trajectory to prevent our bikes from slipping out from under us. I was not going to fall again. The remainder of the ride was mostly dry, with a few bright yellow-green and red-rust algae patches where drainage water was continually seeping into the channel. We passed under several large bridges, including Broadway, the 101 Freeway, First and Fourth Streets and some ambitious long thick concrete walls rising from the channel bed that added extra support for a few sets of railroad tracks. More unintentional contemporary sculpture. The Spring Street or the Main Street bridge was in the middle of an expansion and retrofitting construction project – note to self; come back to this spot to shoot. It was early afternoon as we rode south and particularly warm due to the expansive multi-shaded grey concrete absorbing heat and acting as a reflective light box the entire length of the channel. Eventually, we saw looming in the distance, the remains of the central concrete pier of the Sixth Street Viaduct - erect but mortally wounded with a large bite chewed out of its western flank with frayed rebar projecting from the gash. There was an enormous fabric shroud draped along its eastern flank, billowing out like unwound bandages. The steel arches were gone and there was nothing to be seen on the east bank of the river. The west bank support pier was still intact along with the spans moving west towards Mateo Street. We parked our bikes and I set up my tripod and camera from various vantage points along the channel floor and on the 25 to 30-degree concrete eastern flank. On the west side of the pier, adjacent to the tunnel entrance, there were piles of rubble and a couple of excavators, ready and waiting to complete the demolition - and a bored guard. It was a Sunday, with no crews, no activity, no machines pummeling away at the concrete. And oddly quiet. The river was being directed around the east side of the pier by long rubber dams and concrete jersey-bumpers. As we approached the ruins along the east bank the guard came closer and yelled across the river, telling us we couldn’t go any further south. We weren’t even close to the work-zone and it was on the other side of the water. Whatever. I guess he had to do something to feel like he was “working.” I took some shots from that vantage point, then we headed back into the channel. Because of the temporary re-directing of the water, there was a large shallow pool between us and the ruined pier. My buddy rode his bike around in circles as I shot - testing the slime factor and depth of the water. A brave man. Unlike me, he has the balance of a mountain goat. Mallard ducks were milling about in the river, feeding and serene. The beaten pier’s mirrored image in the water appeared evasive, shifting and infinitely moving. The reflection was curiously beautiful but equally tragic, intangible and unstable; a premonition of its impending collapse. And life continued along its course. My friend decided to head back to Lincoln Heights just before sunset, so I accompanied him about half way, then headed back south to the Sixth Street Bridge to shoot a bit more. I planned to exit the channel by way of a low wall and an opening in the chain link fence next to the Fourth Street Bridge a few hundred yards upriver from where I was shooting. I’d seen some sketchy things go down under the Fourth Street Bridge in my photo excursions, so I was slightly nervous when I realized I had taken too long for just another shot, then another, then another. It was nearly dark when I headed out of the channel. I scrambled up the east flank and hopped over the low wall with my bike and backpack full of gear. There was a group of three of four guys hanging out under the bridge on the other side of the tracks. They were talking, laughing and drinking and then they looked in my direction. Damn it! It was now almost completely dark, so I quickly checked for trains, then ran with my bike along one set of the tracks. There were seven more sets of track to cross, so I couldn’t get on my bike and there were no trains to duck under or hide behind at that point. That was a blessing really, since it made my escape easier. I hurried to the access path that leads out to Mission Street. The guys didn’t follow, they probably didn’t even see me, but when I turned onto the access path there, parked right in the middle of it, were two black-and-white police cars. The policemen were standing outside their vehicles and one was talking on a phone. They were engaged and didn’t even notice me until I was about 20 feet away from them. Funny how the policemen were such a sight of immense relief, but at the same time they utterly heightened my stress and anxiety levels. Surely being arrested for trespassing would be an immeasurably better alternative than being mugged - still I was shaking like the reflection of the broken monolith down in the river. Neither was a choice I wanted to face. The path was wide enough for me to walk my bike along the opposite side of the vehicles and I continued to head towards Mission Street looking directly at the policeman who noticed me. He smiled, waved, thankfully noticing the tripod sticking out of my backpack. He turned back to his partner, who was still on his phone, and continued to tune in to whatever business or emergency he was discussing. Luck? Possibly. They seemed engaged, with larger dragons to slay and I’m sure the last thing they wanted to do was to harass a lonely photographer with a bike making his way home. Whew! In the beginning of November, 2016, over a year into this “project,” I would ride my bike to the west bank of the LA River where the final stages of demolition were taking place. The spans of the west section of the viaduct were not as high as on the east side – but still the standing column ruins were impressive in scale. Nothing remained of the central section over the river and the tunnel was completely covered in the rubble from the de-construction of the spans and columns that stood directly over it. In that same spot where the low-riders gathered and the fire breather lit up the tunnel corridor, there were stacks of wood timbers that had been used for the cranes and gigantic piles of the square rebar - just out of my reach. The thought crossed my mind that I should find out who was actually recycling the steel, so I could buy some pieces. My final night excursion, in mid-November, just before I headed back to Santa Fe, was a day or two after the Super Moon rise. I knew I would be in New Mexico for a month so I wanted to get whatever shots I could of this final stage of the demolition. There was very little left of the now low sloping bridge - less than the block between Santa Fe Avenue and Mateo Street. The access tunnel was cleared, swept and washed clean of any debris but still fenced off and locked. There was a gap in the fence. I set my tripod up so that my camera lens poked through the hole in the fence and I shot the nearly-full moon rising directly over the tunnel. There was no more massive concrete bridge to block the view east and the tunnel’s roof was completely gone until it reached the west side set of Union Pacific Railroad and Metrolink tracks. Most of the graffiti was scrubbed clean from the de-construction process, but there were a few pale remnants. The tunnel didn’t seem scary, smelly, dangerous or mysterious at all and there was no light at its end. No wildlife either. It was one of the few shots I took aiming my camera due east towards Boyle Heights. I’m a rebel at heart - especially in the studio. You have to be when you’re a committed artist - taking chances comes with the job if you want to move forward. I’m a timid rebel when I’m out and about, but the journey of shooting the Sixth Street Viaduct strengthened and emboldened me. I did things in the past year I would do when I was younger, but not as recklessly. I was cautious and aware, but adventurous enough to take risks. Challenging my comfort zone opened up a world to me I would never have seen otherwise - personally, aesthetically, technically and conceptually. The thing is, no matter how much I stressed about a particular circumstance in which I found myself, it always turned out fine. And I never would have been in those particular locations to take the shots, if I had ventured out with no element of risk. The experience has carried over into my work in the studio and when I’m out shooting, with a heightened sense of anticipation of what is to come. The best part is - I have no idea what that might be! When the new Sixth Street Viaduct is completed it will replace the vital transportation corridor the 1932 viaduct provided. Its contemporary exquisite design will connect a reluctant and distrustful community within the city of Boyle Heights, with the rapidly developing districts in Downtown Los Angeles - the Arts District and Financial Districts. Downtown LA west of the LA River is known for multiple development projects not only of new construction but repurposing unused early 20th century buildings as museums, galleries, restaurants, cafes, offices and live-work lofts. High-rise residential towers, office and retail spaces are under construction throughout DTLA. Some of the residents of Boyle Heights are fighting gentrification - or what they have labeled gentrification, targeting all of the art galleries that moved in and repurposed unused warehouse spaces adjacent to the Los Angeles River on the western fringe of Boyle Heights. These activists view the art galleries as early signs of gentrification and blame them for rising property values. Are rising property values a bad thing? I suppose if you don’t own your property, then it could be. There is controversy that comes with the repurposing of under-utilized or empty buildings - and “gentrification” soon follows. Economic boom for some, often trickles down to economic hardship for others in the form of higher rents and an elevated cost of living. Perhaps there is room for contained affordability, controlled growth and neighborhood evolution while maintaining the diverse cultural communities and their intrinsic worth. I’m a Los Angeles native, but also a newcomer. I love LA and its diversity and I view these areas as evolving communities with various, distinct and differing goals. There is room for everyone, but the Los Angeles River divides these communities - in more ways than one. In the last 14 months, I watched and documented a main transportation artery over the LA River be demolished. Metaphorically it also seems to have seriously compromised the connections between two vital and unique subdivisions of Los Angeles. The new Sixth Street Viaduct represents replacement and transitions, perhaps at a quicker pace and differently than some people want, but it has the potential to bridge that which divides the city. It can provide a viable connection for the communities on both sides of the Los Angeles River and at the same time help to maintain their identities without undermining or extinguishing either.